Over the years we have received many questions about the placement of the flags on our pole along the west side of our building. Many people have pointed to the US Flag Code as the proper guideline to flag placement. The flags, as displayed at the Fond du Lac Yacht Club, are correctly placed. We have found various sites that have helped clarify the proper placement. Here is some of the information. The gaff-rigged pole had its origins at sea. Because of all the sail carried by the rigging of these vessels, the flag of a nation could not be clearly viewed if it was placed at the top of the mast. The stern of the vessel was the position of command and the captain's quarters were located aft. Early boats also had the nobleman's banner, king's banner, or English ensign staff fixed to the stern rail. As sails changed, long booms sweep across the stern rail every time the ship tacked, so the ensign staff had to be removed when the ship was under way. Since the captain and other officers were still aft, the nearest position from which they found it practical to fly the ensign was the gaff. Over time, this became the place of honor to display the national flag. When the ship was moored, the ensign staff was set up again on the stern rail. This was the practice in the eighteenth century, when the U.S. Navy was created. Now that warships are made of steel and the signal mast no longer carries a boom, our navy still flies the ensign at the gaff peak when under way and at the ensign staff when not underway. There is no law specifying how a flag should fly on a gaff-rigged pole, instead it is based on long standing nautical tradition. The usual argument given by those that think it is wrong to fly the national ensign from the gaff is that the national ensign is flying below a club burgee or other flag contrary to the Flag Code. Notice that even when the national ensign is flown from the stern of a ship, it is lower in height than other flags flying on the ship. When the ensign is flown from a gaff-rigged pole, a flag flown at the top of the mast is not considered above the ensign because it is not being flown directly above the ensign on the same halyard. The ensign should be flown from the highest point of honor, and over time, that has become the peak of the gaff. Flying the national ensign from the top of the mast while flying another flag at the gaff would be flying another flag in a position of superior honor since the peak of the gaff is the highest point of honor. The Palm Coast Yacht Club near St. Augustine, Florida had a continuing battle with a local veterans group which insisted the club was showing disrespect for the flag by flying it at the gaff of the club's flagstaff, a point physically lower than the club's burgee which is flown at the masthead. The matter was settled only after the club obtained a letter from the Secretary of the Navy confirming the fact that in the world of yacht clubs the highest physical point of a flagpole is not necessarily the place of honor. 4. at the masthead of the highest pole if one of the poles is taller than the others." "A mast should be installed as if it is the mast of a ship putting out to sea, i.e., heading toward an intended viewer. That is, the gaff should point aft. If you stand at the base of the pole looking forward (toward the intended viewer), the extremities of the yardarm are termed port (on your left) and starboard (on you right), just as they would be on a vessel. When the pole is associated with a particular building, the gaff (if any) should extend from the pole in the general direction of the building. Thus, if you stand in or next to the building looking at the pole, think of yourself as looking forward on a ship; the starboard side of the pole is on your right as you face the flagpole." "The flagpole or mast of a yacht club is considered to represent the mast of a vessel, and the peak of the gaff, if one is used, is the place of honor from which the U.S. ensign is flown, just as if would be on a gaff rigged boat." "There has been some confusion because proper flag etiquette requires no other flag to be flown above the U.S. ensign, and obviously another flag, such as a yacht club burgee at the masthead, will be higher than the U.S. flag when the latter is at the gaff. This is entirely proper because 'above' in flag etiquette, means 'directly on top of." 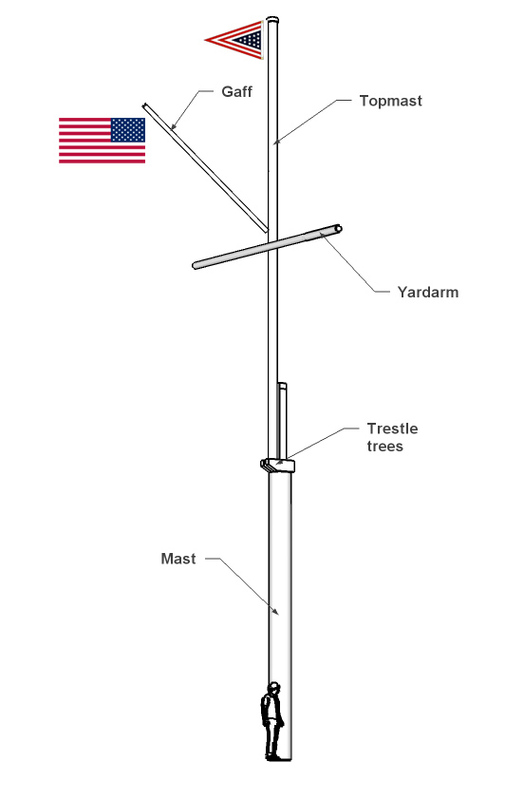 (4) Polemast with Crosstree and Gaff - This is commonly called a "yacht club mast". Displayed from the gaff..."
"The following information is provided in selecting the proper halyard to be used for displaying a personal flag or command pennant with the U.S. national ensign. a. Polemast - Personal flag/command pennant not flown. b. Polemast with Crosstree - Outermost halyard, right-hand crosstree. c. Polemast with Gaff - Peak of pole. d. Polemast with Crosstree and Gaff - Peak of pole." Long standing nautical tradition dating back over 300 years has determined what the highest points of honor are and they are not always the highest point in height. It would be showing disrespect to the national ensign to fly it from somewhere other than the highest point of honor, i.e., at the masthead instead of at the peak of the gaff. The club burgee should be flown at the masthead and when you add additional flags, you start with the halyard on the right (as defined above) and move inward with flags of lower status.